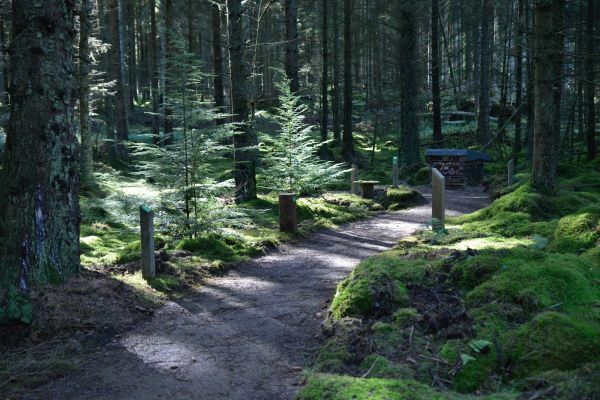 Kielder Water & Forest Park is always particularly beautiful at this time of year and now five new, short walking tracks have been created here for all the family. So why not wrap up warm, head to Kielder and enjoy a little fresh air, wildlife, nature and spectacular scenery over the Christmas holidays? All these walks are included on the free ViewRanger app. Simply install the app on a smart phone and search for Kielder Wild Walks. You can then easily download the route and information beforehand, so you have it to hand whilst walking. You will find the app not only gives you directions and suggests what to look out for, but also offers fascinating wildlife information at each waypoint. You can also listen to audio clips of Kielder wildlife experts talking about all the varied species who live here and how they are cared for. Here’s a quick guide to each walk. Kielder Wild Walk 1 (Bakethin Nature Reserve) is 2.2 km there and back, on even-surfaced paths and accessible to wheelchair users and push chairs. It is clearly signposted from the Bakethin Nature Reserve car park and leads you under Kielder Viaduct, past the dipping pond and along the Lakeside Way to Bakethin Hide. On the way you’ll find beautiful views, interesting wildlife, curious habitats and new features. You can click on each waypoint for more information whilst on the move. Watch out for wildlife from Bakethin Hide when you’re there. Kielder Wild Walk 2 (Castle and Nature Reserve) is a circular 5 km walk exploring the secret wilder paths within the woods. Discover veteran trees, rare breed ponies and lovely views. Kielder Wild Walk 3 (Kielder Castle and Salmon Centre) is a short, easy 2 km walk on well surfaced paths from Kielder Castle, past the playground and Minotaur Maze, and over the river to Kielder Salmon Centre. On the ViewRanger app you can listen to Kielder experts talk about the history, art and wildlife of the area. Kielder Wild Walk 4 (Tower Knowe Peninsula) is just 1.6 km long. It follows waymarked paths and should take around 20-40 minutes. It starts and finishes outside Tower Knowe Visitor Centre, which you can see from the whole walk, so there's no need to worry about getting lost! You walk through a small patch of woodland and then through some heather moorland and down to the lake shore, before returning to this car park along the Lakeside Way path. Kielder Wild Walk 5 (Hawkhope to Belling) is a steady 3.8 km walk along the Lakeside Way on the north shore of Kielder Water. You then take a more rugged path to the Wave Chamber and Belling Peninsula. All these trails, their features, signage, accompanying digital and on-site information were commissioned by Kielder Water & Forest Park Development Trust through the Heritage Lottery-funded “Living Wild at Kielder” project.